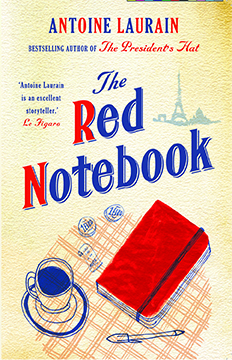 Our December Book a Month selection (and the final title in our 2016 series) is The Red Notebook by Antoine Laurain, a sweet romantic comedy rolled up in a mystery, with a protagonist who would be creepy if he wasn’t so self-aware, and a wonderfully fun cast of supporting characters. Yes, this novel is brief, straightforward, and (some might say) predictable, but that doesn’t take away from the humor and simple pleasure the story brings. Plus, you can’t go wrong with a love story set in Paris! 1. A woman’s purse is a snapshot of her life, and Laurent uses the clues in Laure’s handbag (including her red notebook) to track her down. What would a stranger think if they had to piece together your life based on the contents of your purse/bag? What are the unique or important things you carry with you every day? Is there anything in your bag that would be embarrassing for a stranger to see? 2. There are several supporting characters in the novel that play large parts in the story, whether by accident or on purpose…if any one of them had acted differently, it’s likely the story wouldn’t have ended the way it did. Which character did you like the most? The least? Did any of them do something that confused or irritated you, or seemed out of character for them? 3. Laurent goes to unusual lengths to track down a stranger—including picking up her dry cleaning and practically stalking a reclusive author—and he is often aware that he’s taking things too far. Does Antoine Laurain do a good job of portraying him as a romantic, sympathetic protagonist, or does Laurent cross the line from “persistent” to “creepy” at any point? Is he able to redeem himself? 4. 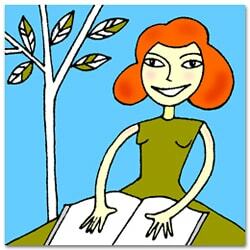 Have you ever done anything ridiculous in the name of romance that embarrasses you to think about now? Did it work out, or backfire? Do you wish you had done things differently? 5. Though we meet Laure briefly at the beginning of the novel, we’re left to learn about her mostly through Laurent’s eyes. We would probably think differently about her if we viewed her through the eyes of her ex-boyfriend, the same way we’d have a lower opinion of Laurent if we were only listening to his ex-girlfriend Dominique’s version of the story. How do the characters’ perceptions and expectations affect the way they interact with each other? How does our own viewpoint affect us in our everyday lives? Thanks for the catch, Chris. We always have multiple people edit these posts, but sometimes errors slip past us! Thanks too for your nice words about our catalog.